As November nears, the dragonflies are starting to be very scant above the ground. On Saturday, I saw a single Common Green Darner in Green-Wood. 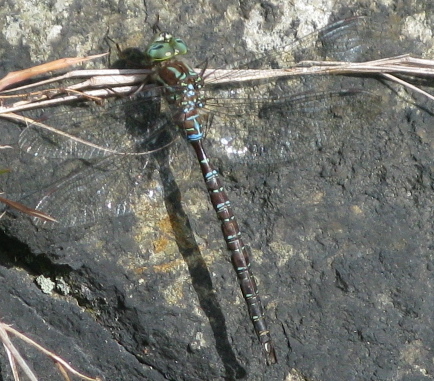 Yesterday, I saw this Shadow Darner (Aeshna umbrosa) at Little Stony Point up in Cold Spring. A new species for me, IDed with help from the Northeast Odonata FB crew. Paulson says this is “usually one of last species of autumn.” Besides a bumblebee, this was the only visible insect there. This afternoon, I saw about half a dozen Common Green Darners patrolling a very sunny lawn in Prospect. Autumn Meadowhawks are usually the latest flying ode in Ottawa, Ontario. One unseasonably warm fall we had them flying until the first week of November! I haven’t seen any in over a week now, and with the colder weather, they may be done for the year. I’m sad that I have to put my dragonfly net away for the year.